This classic and authoritative student textbook contains information that is not over simplified and can be used to solve the real world problems encountered by noise and vibration consultants as well as the more straightforward ones handled by engineers and occupational hygienists in industry. The book covers the fundamentals of acoustics, theoretical concepts and practical application of current noise control technology. It aims to be as comprehensive as possible while still covering important concepts in sufficient detail to engender a deep understanding of the foundations upon which noise control technology is built. Topics which are extensively developed or overhauled from the fourth edition include sound propagation outdoors, amplitude modulation, hearing protection, frequency analysis, muffling devices (including 4-pole analysis and self noise), sound transmission through partitions, finite element analysis, statistical energy analysis and transportation noise. For those who are already well versed in the art and science of noise control, the book will provide an extremely useful reference. A wide range of example problems that are linked to noise control practice are available on www.causalsystems.com for free download. "A nice balance has been achieved between the theoretical background needed for a good understanding, and practical applications. Furthermore, the choice of topics and the way they are treated makes this book suitable for both engineering students wanting some more material pertaining to their studies and confirmed old salt acoustical engineers wanting to upgrade their skills." "The 5th edition of this book is a thoroughly updated and re-organized textbook in comparison with the previous editions… It contains a fair amount of new material, with many conceptual illustrations and extensive references. The book represents a comprehensive handling of the state of the art of important topics in acoustics and noise control engineering, and brings together a lot of relevant practical information, presented by authors with much knowledge and practical experience. The book represents a compilation of conventional and advanced material, including many useful calculation details, hints, and instructions, valuable to both academics and acoustical consultants as well as noise control engineers." Fundamentals and basic terminology. Subjective response to noise. Frequency analysis. Instrumentation for noise measurement and analysis. Sound sources and outdoor sound propagation. Sound power, its use and measurement. Sound in enclosed spaces. Partitions, enclosures and barriers. Muffling devices. Vibration control. Sound power and sound pressure level estimation procedures. Practical numerical acoustics. Appendices: wave equation derivation, properties of materials, acoustical properties of porous materials. References. List of acoustical standards. Colin H. Hansen is an Emeritus Professor at the University of Adelaide, Australia. He is past President and Honorary Fellow of the International Institute of Acoustics and Vibration and recipient of the 2009 Rayleigh medal by the UK Institute of Acoustics, as well as the 2013 AGM Michell Medal by Engineers Australia. 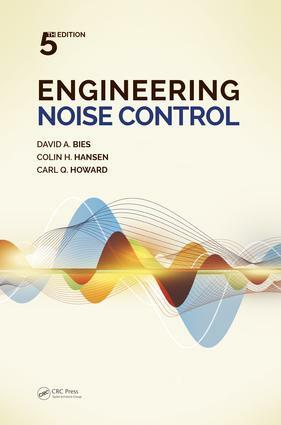 He is also author of Active Control of Noise and Vibration 2nd Edition (2012), Noise Control from Concept to Application (2005), Understanding active noise cancellation (2001), also published by Taylor & Francis. Carl Howard is an associate professor at the University of Adelaide undertaking teaching, research, and consulting in acoustics. He has been a consultant with Vipac Engineers and Scientists, Worley and Colin Gordon and Associates, and also worked at United Technologies Research Center.